Oregon PowerSharp Guide Bar 14"
Sharpen Your Chain In Just 5 Seconds! Yes that's right! Sharpen your saw chain in 5 seconds! Do you find yourself stuck in the middle of a sawing job with a dull chain? Here’s how you get going again in 5 seconds flat. When the chain becomes dull, attach the bar-mount sharpener to the PowerSharp® guide bar by sliding the steel pins through the guide holes, then closing and latching the cover. Press the foot of the sharpener against a solid object, applying light pressure for 3-5 seconds. And you are back in the cut with a precision-sharpened chain. PowerSharp® Chain has unique, top-sharpening cutters and is low kickback per ANSI B125.1 and CSA Z62.3. Chisel-style cutters, ramped depth gauges and ramped guidance drive links provide a smooth and efficient cutting action and good chip flow. The diamond-coated dresser link resurfaces the sharpening stone, ensuring flat cutter to stone contact. Look for the PowerSharp® diamond stamped on each cutter link. 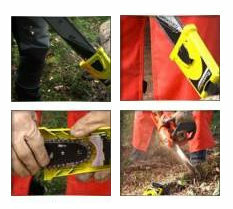 Only genuine PowerSharp® saw chain can be used with the PowerSharp® system. Lightweight and manoeuvrable, the PowerSharp® guide bar is designed to replace your existing guide bar. Alignment and latch pin holes for the proprietary sharpening tool ensure perfect alignment between the cutter and the stone. Small nose radius helps to reduce kickback energy. Available in three lengths for the majority of saw mounts.